Cuba Gooding, Jr., is a good actor (he won an Oscar his work in Jerry Maguire), but he makes a lot of bad choices in roles. Snow Dogs and Rat Race were lamentable wastes of his talent. Radio isn’t a lot better, but it’s a step in the right direction. The Rookie, another sports-themed movie with the same screenwriter. The course of the movie follows Radio as he gradually opens up. At first he mistrusts everybody, and with good reason. His first encounter with the football team ends with him bound and locked in the equipment shed. But coach Jones has patience, and he eventually gets Radio to come out of his shell. Before long, Radio is a staple at the high school. He becomes a sort of unofficial mascot of not only the football team, but the basketball team and the morning radio announcements. Since this is a Hollywood movie, there is inevitably a contrived conflict. The parent of one of the football players (Chris Mulkey) hates Radio and poisons the well of public opinion. He gets the school board to investigate whether Radio can be trusted around children, even as we learn Radio’s bittersweet backstory. I’ll leave it to your imagination whether or not Radio and coach Jones overcome adversity in the end. Character actor Alfre Woodard plays the school principal. She gives lip service to one of the more troubling undercurrents of Radio’s story, namely whether Radio is being made an object of public ridicule. Are the kids laughing at him, or do they actually like him? Another uncomfortable problem is the amount of time coach Jones spends on Radio. As he admits in the movie, he sometimes neglects his wife and daughter to spend time with him. Did Jones always want a son? Is there something wrong at home? These conflicts are actually more substantial and would have been more interesting than the contrived hatred of a narrow-minded parent. But they don’t translate into black and white as well. This isn’t an art film, it’s a “feel-good” movie, and subtlety and substance just don’t cut it. An evil parent who has it in for Radio is easier to boo. In its favor, Radio does show some good craft. As expected, Gooding’s acting is top notch. And the art department knocked itself out dressing the people of Anderson, South Carolina. (Radio is set in 1976). 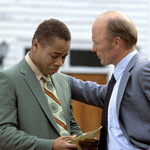 Ed Harris wears shirts I’ve seen in my stepfather’s closet and polyester pants with extra-wide waistbands that I’ve only seen on gym teachers. But the primary focus is the story of Radio becoming an accepted part of his community. It’s a nice story, and it does feel good. I can’t recommend it very highly because it’s too formulaic and syrupy. But if that’s your preferred recipe, Radio works.